A historic visit by Turkish President Recep Tayyip Erdogan to Athens on Thursday that had been anticipated as an opportunity to improve bilateral relations transpired into a series of testy exchanges with both Erdogan and Greek officials airing long-standing grievances. Diplomatic sources had indicated ahead of the visit that Erdogan would likely use the visit to Greece, the first by a Turkish president in 65 years, as an opportunity for rapprochement in view of his increasing isolation from the West and the European Union. Instead, Erdogan set out a series of demands, including the revision of the 1923 Treaty of Lausanne, which defines the borders between Greece and Turkey, and greater rights for the Muslim minority in Thrace, northern Greece, which the Turkish leader is to visit on Friday. “Many things have changed in 94 years,” Erdogan said, referring to “outstanding issues” in the treaty that need to be addressed. The treaty was supposed to protect the Muslim minority in Greece, but instead they are discriminated against, Erdogan charged, calling for increased rights for the Muslims of Thrace including the right to elect their own religious leader. 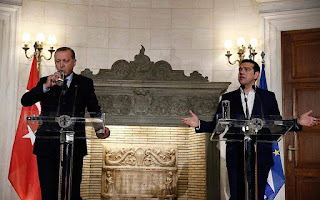 Erdogan broached the same topics in a subsequent press conference with Prime Minister Alexis Tsipras later in the day, albeit slightly less aggressively. Having underlined the need for respect of “international laws, treaties and territorial integrity,” Tsipras said he was unclear on what exactly Erdogan wanted. “The truth is I‘m a little confused regarding if what he is putting on the table is to modernize, to update, to comply with the Lausanne Treaty,” Tsipras said. He also sought to extend an olive branch to Erdogan, saying “let us open a new chapter together that is not based on mutual suspicion but on an effort to build bridges on firm foundations.” The sentiment was not reciprocated. Erdogan called for the extradition of eight Turkish armed forces officers who fled Turkey on a helicopter during a botched coup in the summer of last year and have since sought asylum in Greece. The Greek Supreme Court rejected Ankara’s demand for their extradition in January but Turkey simply issued a new extradition demand. Stressing that Turkey has no death penalty and “is not a country that tortures inmates,” Erdogan said the men would receive a fair trial. The two leaders also discussed the refugee crisis, and agreed to work together in tackling it, as well as the Cyprus problem, on which they essentially repeated their positions. Κατερίνα Παπακώστα: Τα Εξάρχεια είναι η… Μονμάρτη της Αθήνας! Ανέκδοτο: Δεν είμαι πια παρθένα! Δημοσκόπηση ΠΑΜΑΚ: Προβάδισμα 12 μονάδων για Ν.Δ.